Marketing communication is being ruled by visuals right now, and why shouldn’t it be, considering that billions of people are using smartphones in their daily lives. Even if they aren’t, they are never too far away from a screen that can show them ads relevant to them. At such times, creating eye-catching visuals for promoting your products and services is almost a necessity. Not everyone has a graphic design background or someone with that kind of expertise that they can rely upon. A tool like Crello can hence be your go-to resource at such times. 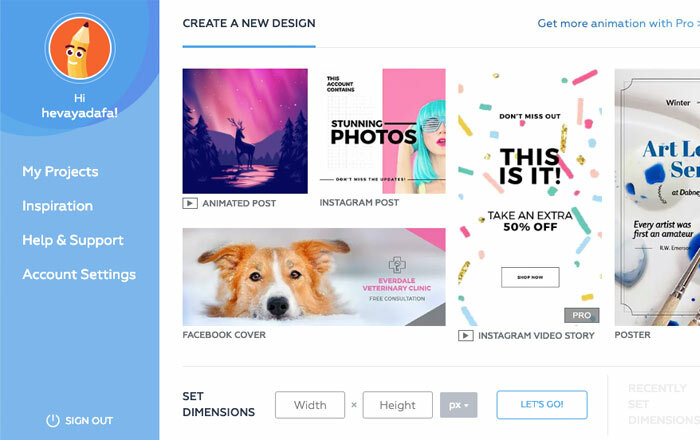 If you’re looking to create marketing materials, event invites, blog graphics, social media posts, animations or just simple print ads, this is the only tool you’ll need. And you can rest assured that you won’t need to work hard, since Crello has been populated with a large number of templates that you can utilize for your own benefits. These designs created with the latest graphic design trends in mind by a diverse team of professional designers. The collection is constantly growing, and contains themed templates that can be used for a wide variety of occasions. All you need to do is modify them slightly to suit your desired result. As soon as you open the website, you are greeted with attractive templates for videos, animations and static images. These are organized into frequently used graphics like those for Facebook cover posts, Instagram posts, Instagram stories and more, so you won’t have to worry about the right dimensions. Either by clicking on them or by setting the dimensions yourself can you enter the section where you make the graphics your own. On the left, are all the tools you’ll need to customize the posts. This extensive toolset lets you import your desired template and change it according to your needs. You can resize its elements, add your own logos to it, modify the text and fonts and do much more. Think of it as a simplified version of Photoshop that’s replete with resources to spruce up your designs furthermore. Within minutes, your graphics will be ready to be posted onto Facebook, Instagram, Twitter, YouTube or whatever platform you wish to share them on. Video animations are another area which Crello excels in. With this facility, you can create Full HD animations, Facebook video covers, animated social media posts and Instagram Stories easily. There are plenty of animated templates and stock videos to choose from here. The editing screen is pretty similar to what you get with static images, but there’s an extra animation section, which lets you add cool moving graphics to your posts. Using animated posts is a surefire way of getting noticed on social media, so there’s no denying that this section is an incredibly useful one for those looking to attract some attention towards their businesses. Everything you start doing on this website gets stored in the cloud, so you don’t need to worry about saving your work all the time. Keyboard shortcuts are very important for ensuring that your graphic design workflow is simple and quick. Crello has you covered in that department as well. It has been endowed with a long list of shortcuts that you can take advantage of as you are building your project. You need to sign into Crello in order grab its benefits. If you like it, you will only be able to exploit it fully by getting its paid subscriptions. A monthly plan costs $19.99, while a yearly plan, which is much more economical, will set you back by $199.99. 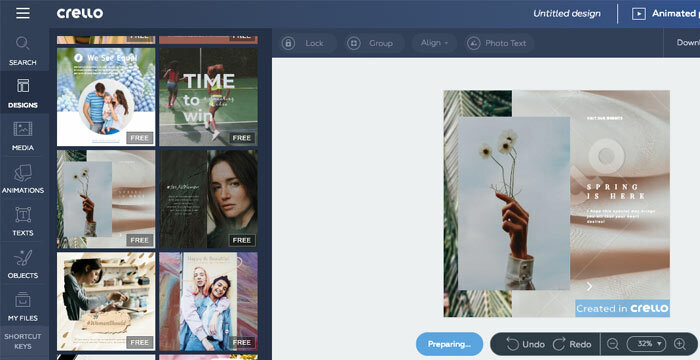 And you’ll be glad to know that starting April 2, Crello will be getting new features and a new Advanced Subscription Plan with even more tools for creating designs. For a limited time, users can will be able to grab a 50 percent discount on this plan. Previous articleHow Stock Illustrations Can Help Make A Website More Attractive To Visitors?